This blog post is long overdue, mostly because of a number of publications that needed finishing. Although I enjoy blogging a lot, if I want to stay in work as an academic I need to publish academic books and papers – ‘publish or perish’. There is a lot of discussion going on both in the Netherlands and internationally right now about the pressure to publish as much as possible in a relatively short time. Read more here (in English) and here (in Dutch) for example. Personally, I do feel that pressure too of course, but I enjoy writing the academic publications and I try to make time for other things I find important – like this blog. 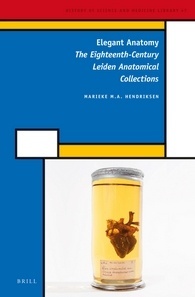 My book on the eighteenth-century Leiden anatomical collections, Elegant Anatomy, is based on my PhD thesis and now available from Brill. I’d like to use the opportunity to thank everyone who helped me once more, especially the two reviewers who helped me tremendously with their constructive comments and the lovely people at Brill. 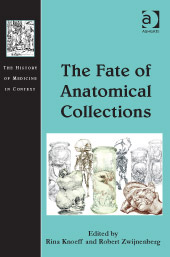 Another result from the ‘Cultures of Collecting‘ research project in which I wrote my thesis is a wonderful collection of essays, The Fate of Anatomical Collections, skillfully edited by my former supervisors, Rina Knoeff and Robert Zwijnenberg. It is now available from Ashgate and contains many fascinating contributions – I wrote a small piece on the fate of eighteenth-century bead-decorated preparations of fetuses and babies of unclear origin. Moreover, I wrote an article about anatomical mercury that is now available online in the Journal of the History of Medicine and Allied Sciences, and which will appear in the printed journal this year. Last but not least, the article resulting from the same project that originally inspired this blog, my research on nineteenth-century medicine chests in the National Maritime Museum in Greenwich, London, will soon appear in the Journal of Victorian Culture. If you are interested in reading any of these but don’t know how to get to them please do not hesitate to contact me. If you read the Medicine Chest for fun, I can imagine that you find the above publications a bit too much – don’t worry, I’ll be back with more of the usual ‘light’ reading soon! I also now realize that many of you probably do not know that I also contribute to the fabulous Recipes Project on a regular basis: you can read my blogs for them here.